Discussion in 'Washington D.C.' started by Magoo, Nov 9, 2013. Republican opponents of Obamacare ought to feel lucky the October rollout of the program was such a disaster, because their other big gripe about the health-reform law — that it will kill jobs — isn’t coming close to panning out. Hmm I wonder how many of those jobs are part time. Seems like I'm hearing left and right of people are having their hours reduced to less than 30 hours per week. Hell, 5 hours a week would be a full time job for a libtard, right Mags? Well maybe, someday, but in the law’s first month of existence it appeared to have no impact whatsoever on jobs. Wow! a whole month! we shall see mags, if they were wrong on this fact it will be the only thing they have been wrong on so far........has it created any jobs? besides the IRS jobs that is? Oh and hey mags.....did Obama lie to the American people? Reuters) - U.S. job growth unexpectedly accelerated in October as employers shrugged off a government shutdown, suggesting the budget standoff had a more limited impact on the economy than initially feared. Wow mags payroll jumped in October! now lets see....Christmas in December??? Wholly S#!% Mags the seasonal hiring has started just like it has for my 52 years of existence, maybe age is taking your memory but not mine lets wait for those feb. numbers to come in. However I am glad that you posted proof that the government shutdown really had no impact despite the claims of the democrats, hell it probably helped these job numbers since they probably claimed the government workers returning to work were new jobs! I cant wait for these guys to be in charge of obrokeacare! How did you find this as good news Magoo? U.S. employers added 204,000 jobs in October, nudging the unemployment rate to 7.3 percent, up from its previous posting of 7.2 percent, the U.S. Bureau of Labor Statistics reported Friday. The U-6 unemployment rate, considered a broader measure of actual unemployment in the U.S., increased to 13.8 percent, up from 13.6 percent. .....The jobs report also showed the unemployment rate rose slightly to 7.3%, up from 7.2% in September, but economists expect this to be a passing blip. 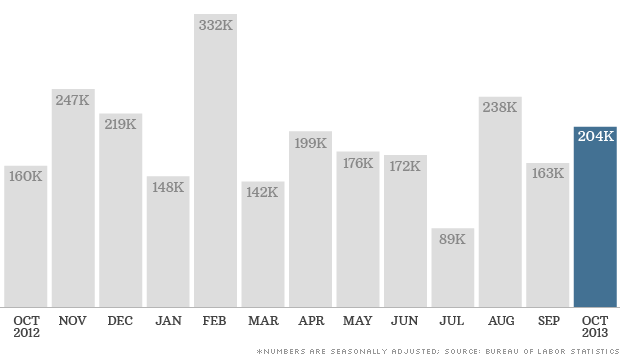 About 448,000 furloughed federal workers were counted as being on temporary layoff, and the next jobs report, due on December 6, will probably show these people were back at work in November. You have to get up early to outwit Magoo. Management are considering banishing me. PART TIME is the new full time. 30-35 hrs a week is it and overtime shall be considered as "voluntarily assisting the company growth". Your focusing on furloughed gov't workers Mags but, why do you ignore this?? He ignores all that is not convenient for him.